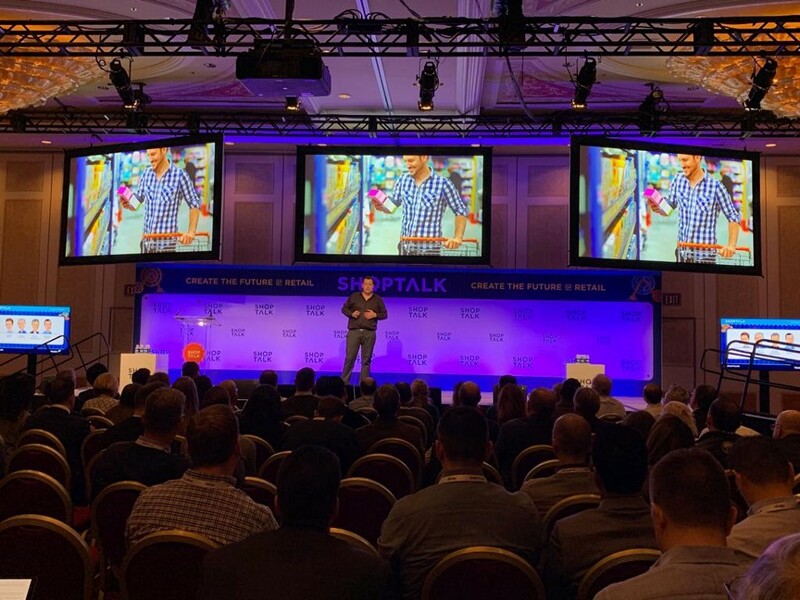 Earlier this month, I attended the 2019 ShopTalk retail conference in Las Vegas. The 4th annual conference hosted 8,500 participants from all over the world, 5 different content tracks, and several keynote addresses and interviews with some of the world’s leading decision-makers, retailers, startups, investors and brands (Nordstrom, Pinterest, Gap and Macy’s — to name a few). Here at Vertex Ventures, we have made four investments in the eCommerce and retail sectors over recent years. Therefore, attending this conference was key for providing insight into new trends in the field and how the retail sector as a whole will be disrupted in the near future. As Aviad Ariel, GP at Vertex, wrote in his recent blog post, we think that Retail is not dying, but it is definitely going through dramatic changes. This was one of the most significant narratives delivered throughout the conference — how the online shopping experience intertwines with the offline (physical) aspect of shopping. For many years, retailers and brands treated these two channels separately, unable to extract true data and measure the correlation between online and offline shopping. Today, brands understand that in order to get the best conversion rates and relevant data –the two must become one. The good news is that today’s technology and emphasis allow data integration to take place effectively. According to Lowe’s (one of North America’s largest home-improvement retailers) CEO, Marvin Ellison, 30% of the company’s shoppers who “buy online then pick-up at store” will also buy additional items during their physical visit. For Nordstrom, a well-known chain of department stores in North America, 50% of the in-store purchases involve some kind of online research while the customer is physically located in the store itself. These examples reflect the great potential of integrating online and offline channels for retailers across the world. As consumers, we used to prioritize which brands we bought and product price, often willing to ‘compromise’ on expected delivery time for good, cheap products. Thanks to Amazon, there is a revolution underway in terms of the way people shop; now, we expect every product we buy to be at our doorstep within 48 hours. The second standard Amazon has set is the convenience and efficiency of its shopping system (Amazon Go created the leading convenience concept). In order to meet Amazon’s standards, retailers should add new features to their operation mechanisms. One of the most surprising things I witnessed was how innovative Walmart is with this issue, and the great effort they invest in creating a rich and comfortable shopping experience for their customers. Tom Ward, SVP of Digital Operations at Walmart, shared some of the new initiatives in these fields, such as the ongoing automation efforts that are taking place. Robots will operate Walmart’s warehouse in Shafter, California, where they will stack and load products more rapidly and efficiently, maximizing the available space on trucks that trundle off to Walmart stores. Add that to the company’s vision to use autonomous delivery vehicles and you might just see Walmart leaving another mark in Retail history. Personalization is still a strong buzzword and allows retailers to communicate better with their customers. According to Daniel Alegre, President of Retail Shopping and Payments at Google, 70% of customers are more likely to purchase when the information they see is customized based on their location. 58% want promotions based on purchase history. Dynamic Yield (a Vertex portfolio company), a personalization platform for Retailers, showed an astonishing x35 ROI on personalization in recent years. Some of their customers saw a 39% increase in revenue per user on average — another indication that personalization is something that all retailers should consider. Authenticity is another dominant factor in retail experience. People love to consume ‘authentic’ content, recommended by real people and not just by advertising platforms. Yotpo, a consumer review platform and another one of our portfolio companies, conducted a study of on-site consumer behavior and found that nearly ⅓ of all visitors to eCommerce sites will click to view customer photos or read reviews. In some industries, such as electronics, the number reaches over 40% of customers. Although many brands and retailers are closing stores, some are also opening new stores after changing their model and strategy. Gap is an interesting example since they are shutting down 230 of their brand stores. According to their President and CEO, Art Peck “The mall formula is no longer nearly as effective as it used to be…” and local Gap stores see two-three times more conversion rates than the traditional “in mall” stores. Gap is leaving the malls and big shopping centers outside the city, to open new locations at local urban neighborhoods, in order to still participate in customers’ shopping journey. Human-less — We are not far from the day that robotic systems will reach out and hand us the right shoe from the shelf, operating the whole store and warehouses. Holistic Solutions — When I joined our portfolio company Trigo Vision in some of their meetings during the conference, the repeat feedback we heard from retailers was about the “holistic solution” and approach they provide. Retailers prefer companies that will help them with digitizing offline processes and give them end-to-end solutions. Trigo provides grocery retailers with inventory transparency, in-store analytics, seamless check-out process, theft protection and much more. The customer wants a seamless transition between the physical and the online store. Reaching consumers at the right moment (just before purchasing) might become a marketing campaign KPI — “When you see something that catches your eye, we want you to be able to take action…Understanding that and meeting consumers where they are in that journey is really important.” Ben Silbermann, CEO of Pinterest thinks that discovery and inspiration are going to play a significant role in future retail. “Voice is the new HTML” according to Amazon’s Chief Evangelist for Alexa and Echo Devices. Voice-based shopping is expected to hit $40 billion by 2020, up from $2 billion today across the U.S. and the U.K. Walmart adopted this technology as well, enabling orders through Google Home. Today, more than 39 million Americans own a smart speaker at home, and Apple’s Siri is accessible to over 500 million users around the globe. There is no doubt that this trend is here to stay and far from being fully implemented. There is no doubt about it — the retail revolution is underway! New technologies, innovations and the heavy-tectonic changes in how people buy will all change this industry forever. Retailers who understand this and ‘go with the flow’ are going to stick around for many years. But those who fail to see where the ship of potential customers is sailing — and stick to the old methodologies — will most likely be left behind!